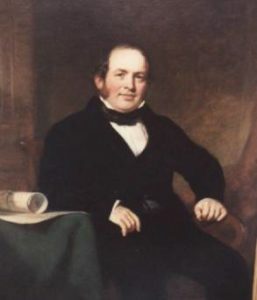 John Macgregor (1802–1858) was a Scottish shipbuilder. John Macgregor was christened on 24 August 1802 at Fintry, Stirlingshire. He was the third son of James Macgregor, a clockmaker, and Annie McNicol. He also had one elder sister, two younger sisters, and two younger brothers. His father qualified as a clockmaker and he moved through Balfron, Fintry, and Comrie with his family working all the time as an engineer in the cotton mills that were developing in these parts of the Highlands. The family were incomers to Fintry, having moved from Balfron. They remained there for about 14 years, before moving on to Comrie in Perthshire, where the last two of their eight children were born. The stay in Comrie must have been short, although John received a rudimentary education there. When John was 16, the whole family moved to Glasgow. John began his apprenticeship as an engineer under David Napier at Camlachie. Macgregor went to Lancefield Foundry with the others in 1821 and was a sea-going engineer on the Belfast – which had Napier machinery – while still in his early twenties. The Belfast plied between Liverpool and Dublin, and was one of the earliest steamers to cross the Irish Sea.